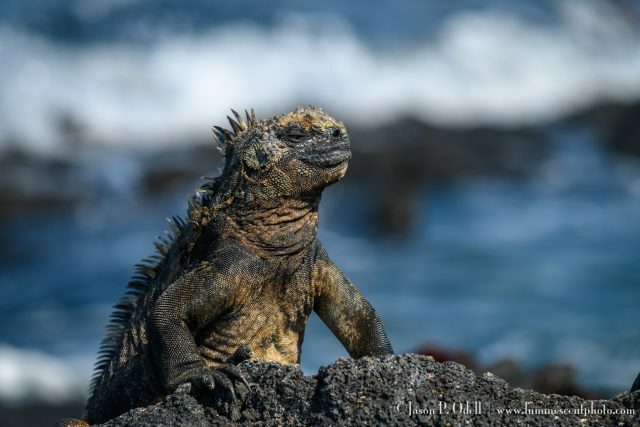 Because 97% of the Galápagos is a national park, you cannot simply show up and visit. All tours are coordinated through the park system and are extremely regulated. To get to Galápagos, you first fly to Ecuador. Our tour originated in Quito, which is situated just south of the equator at an elevation of around 9000’. I chose to arrive a day early so that I could explore Quito a little on my own at first. In Quito, the weather can be a bit unpredictable depending on the time of year you visit. In the North American winter/spring, it’s usually cool and there’s a chance of thunderstorms often. Of course, the first day we were there, it was sunny and quite warm. If you’re visiting from sea level, be very careful to hydrate properly. You’ll quickly discover that stairs and inclines are a lot harder to traverse at this altitude. 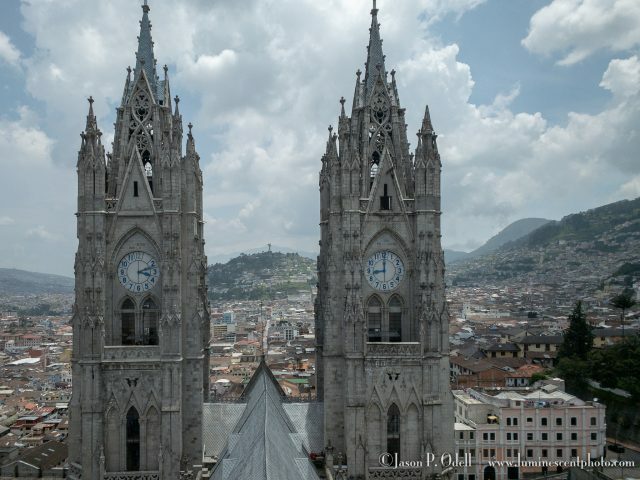 We climbed to the top of the tower at the Basilica in Quito, but we couldnÕt be sure what time it was! In Quito, you can either explore the city on your own, or take guided tours to other regions nearby. Most tour operators and hotels will offer some packages you can choose from. I chose to explore Quito on my own, and Uber was an easy and inexpensive mode of transportation. Between my rudimentary Spanish skills and Google Translate (download the language packs to use off-line), I was able to get around pretty easily. While I never felt unsafe in Quito, you do need to take the standard precautions. I used a money belt and only brought as much cash as I thought I’d need for the day and a single credit card. All my other travel documents were locked in my hotel safe. I kept my cell phone in a zippered pocket, too. The next day, we were shuttled to the Quito airport (a beautiful, modern airport) to catch our flight to the islands. This flight was arranged by our tour provider as part of our travel package. When you arrive in the Galápagos, your luggage will be inspected by a team of canine sniffer dogs that are trained to detect seeds/agricultural products. 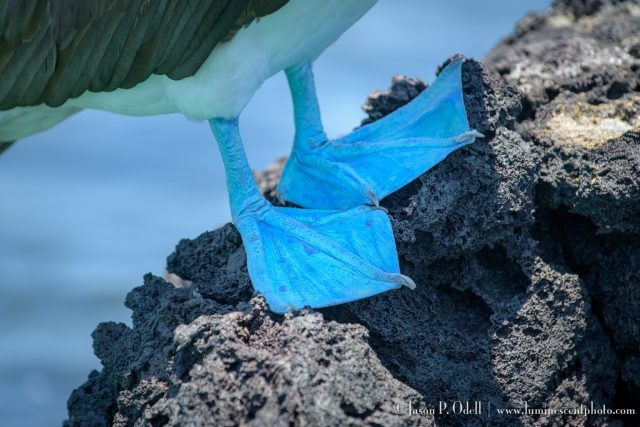 The Ecuadorean government is very serious about keeping the Galápagos as pristine as possible while still supporting a robust tourism industry. After a short bus ride, we met our guide, who would spend the entire week with us aboard our charter yacht. Every visitor to the Galápagos must be accompanied by a park service guide at all times. Our guide was extremely friendly and very knowledgeable, and he was part of what made our experience fantastic. The next thing we learned was that all transport to and from our yacht was by “panga;” inflatable zodiac boats. At no point during our itinerary did our yacht moor at a dock. This is an important point, because you’ll need to not only be able to manage your gear in a zodiac, but also have appropriate footwear for the landings.